Ed and the gang over at Photizo are going to kill me for the headline, let alone the picture. Three years ago few talked about real Managed Print Services - but Photizo was. Toner re-man guys were saying, "...we've been doing MPS for 25 years..." - this before most defined MPS. I am not kidding, at ITEX, 2009 one schmoe had the gall to say this to my face, and then try to sell me on remanufactured, color toner cartridges. Indeed, so many folks tried to define MPS in their likeness, it became really funny to watch. And those doing all the defining had never DONE MPS. But Photizo had The MPS Adoption Model. 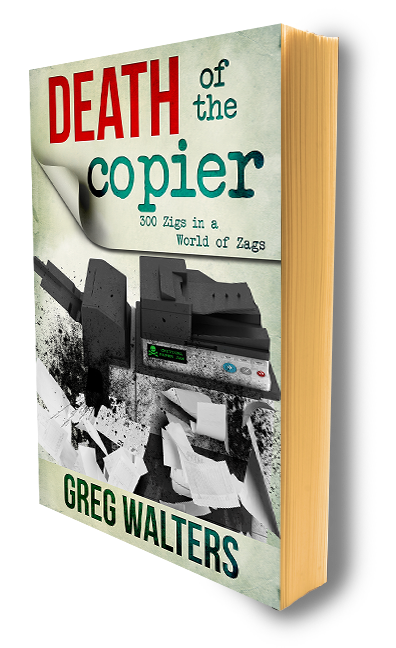 Back then, copier guys were simply trying to stay alive - not much has changed today - the OEM's had no clue and the IT sector saw nothing wrong with 2 point printer deals, attached to CarePacks. Okay, so maybe that hasn't changed all that much either. The 2011 Global MPS Conference is going to be huge - to date, the number of registered matches the number of attendees at the 2009 Conference. When most charge for the honor of speaking and need to piggy-back with other, failing conferences, how many shows do you know that are experiencing an INCREASE in attendance? What, you think that's wrong? Old Skool, sometimes, isn't all that nostalgic. Stratifying, dividing, parsing, trimming, to prune, separate the boys from the men, girls from the women, the chaff from the grain, sink or swim, live or die - this is where we are today in the evolution of the MPS Ecosystem. Mergers, acquisitions, economic upheavals, our little MPS galaxy is expanding and contracting; new stars born, others collapsing from their own gravity. And you know what that forms. It wasn't that long ago, when we felt MPS was for everybody, no matter what sector of imaging you originated in, there was a place for you in the New MPS Ecosystem. Maybe now is time to re-evaluate. Perhaps, Pure Managed Print Services isn't for everybody. And let's extend this - could there be clients and prospects who do not appreciate MPS? Is it possible that some clients are just too ignorant to understand? Could they be blissfully existing in the status quo, in Stage 1 and Stage 2? A wise man once said, "Ignorance leads to stupidity." This year's conference will focus on Stage 3 of the Photizo, MPS Adoption Model - "Enhance Beyond the Fleet". There will be success stories, there will be case studies, there may even be a Hall of Presentations. The first keynote speaker, AUXILIO, Inc. President & CEO Joseph J. Flynn, is not a sponsor. The second keynote Peter Sheahan, the author of Making It Happen: Turning Good Ideas into Good Results, isn't even from the industry. I know there are many who, like me, have moved beyond the box, and yearn for something more, something bigger, something to believe in. We'll be in Orlando meeting with like minded 'To The Right of the Bell Curve' searchers - old skoolers should just stay out of the way.